Put your faith in a service in Nine Elms with a client satisfaction rating of over 96%! Q: How will the window cleaning refresh my premises? A: We can promptly remove stains with either outer window cleaning (for four-storey properties), rope access window washing (for high-rise properties), or via the common manual cleaning of interior casements. Q: Can you share with me a tad more about your water-fed pole cleaning method? A: Absolutely! This equipment can expand up to 22 metres in length, allowing the cleaners to painlessly reach and clean even the farthest corners of your panes. A: Our water is distilled from any residue-causing minerals. When this water evaporates under the sun, it won't leave any streaks behind. A: Rainwater is usually dirt-free, so it won't halt us from doing our job. However, while we won't be bothered by a slight drizzle, a sudden cloudburst can lead to unsatisfying results. During thunderstorms, we may have to delay our service for a day of your choice to ensure the team's safety. Q: Do I need to stay in my home or office until the service is done? A: No, the seasoned window cleaners in Nine Elms can easily perform exterior window cleaning while you are away, as long as your property gates are unbarred. And if you want your casements to sparkle on the inside, just book our free key pick-up and delivery alternative instead. With the intuitive water-fed pole equipment, the experts can help you outshine your competition at fair prices. And you can slash our window cleaning Nine Elms rates even further by combining two or more of our washing services together! To check the exact amount behind our price offers, make sure to browse our neat price table below. Depending on your needs, our window cleaning Nine Elms can provide you with three options. 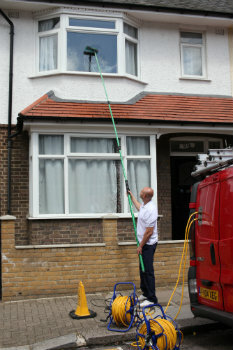 If you pick external cleaning, the specialists will utilize a special water-fed rod. This gear can expand up to 22 metres in length, which is comparable to the height of a four-storey premises. The Nine Elms window cleaners will use purified water under high pressure that will blast away all grime in little to no time. If you own a high-rise property instead, then go for our rope access window cleaning. There, a team of approved climbers will painstakingly polish your windows until they spot the mirror image of the setting sun. For your ease of mind, we check the cleaning equipment on a day-to-day basis and can provide COSHH reports at your request. For interior cleaning, the adepts will bring ladders and sponges to ensure that even the highest spots will benefit from proper treatment. Do any of your relatives need help with rinsing away resistant window streaks? Keep on reading to learn which districts the Nine Elms window cleaners frequent. Another quick and easy way to get a free instant quote or to book window cleaning services Nine Elms SW8 is through our web site.